Single varietal made with heirloom New York State apple. On the nose: ripe, ripe wild plums, coconut, and honeysuckle. In the mouth, bright acid and dense, salty minerals. The finish is lemon water, wet stone and wild strawberries. Pair this cider with rich soft cheeses, fresh sourdough bread, and oysters. In 2017, we harvested about a ton of Northern Spy apples from our young trees in Van Etten and 2 tons from our Newfield orchard. The Van Etten site, a treacherously steep shale shelf with a bit of silty loam on top, produces cider with a lot of tannin and verve, while the Newfiled site, with it’s impossibly deep, dry gravel, produces cider with crystalline minerality. The 2 to 1 ratio of our orchard sites resulted in an energetic cider that still has a lot of finesse. Bone dry and pure, it retains all the varietal aspects of Northern Spy that we have come to know and love while still reflecting the site variation. It’s this ability to express geography that makes Northern Spy such an exciting variety to us. And the fact that it was a widely planted apple in the North East two and a half centuries ago means old trees can still be found growing in orchards and on homesteads across our region and even up into Canada…an amazing opportunity for orchard-based cider-makers wishing to say things about the land with cider. Where on earth did this apple get its unusual name? 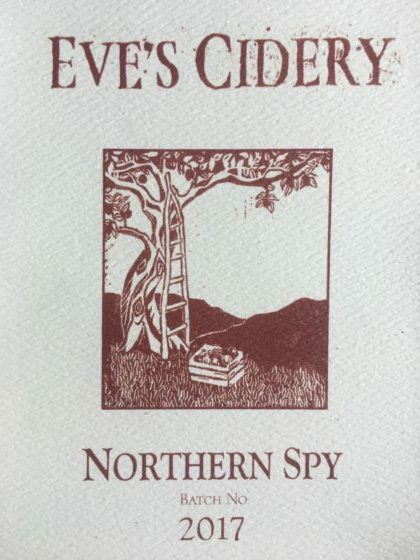 Legend has it that it was named after a popular novel of the day: “The Northern Spy, The Fatal Papers: A Story of Virginia” an abolitionist leaning book about slave catchers and northern spies. The apple originated as a chance seedling growing in East Bloomfield, New York (where a marker remains to this day), a Quaker town that was a major depot on the Underground Railroad. Certainly one can imagine escaped slaves on their way north to Canada, stuffing their pockets with this dense, hard, long-keeping apple. And while there is no way to verify this origin story, we hope it sticks as a reminder of the piece of New York history that it recalls.